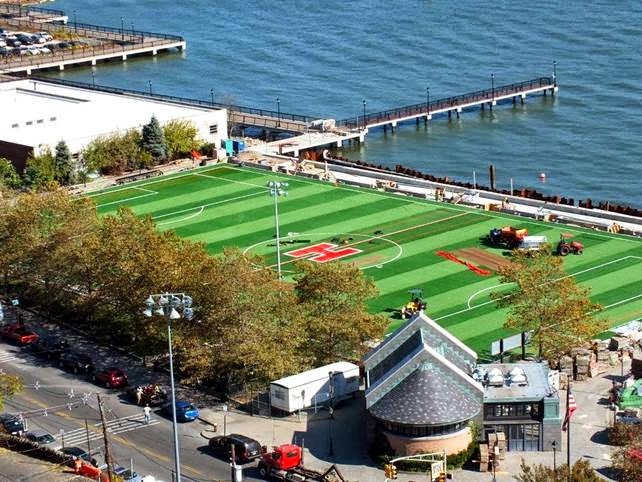 The reconstruction of Sinatra Park is nearing completion, with the turf for Sinatra Field being installed this week. The park is being completed under budget, and there are no overtime costs for the completion of this field because the contract included a liquidated damages clause with a $1,500 per day penalty for failure to complete the park by the agreed-upon completion date. “Thanks to the fine work of our City’s legal team, the contractor has worked hard at their own expense to complete this park as quickly as possible,” added Mayor Zimmer. Renovations to the dog parks in Church Square Park, Stevens Park and Elysian Park are underway and will include canopy structures for shade and shelter for inclement weather, new benches, fences, gates, pet waste bag dispensers, and improved dog water fountain. The stone dust surface previously used at dog runs is being replaced with ¾” pea gravel. “Thank you to our dog owners for your patience as we complete these important renovations to make sure our City is as dog friendly as possible,” added Mayor Zimmer. Ramos campaign: Zimmer breaking GOTV "promise"